For this years Foothill Quilt Guild's annual show the theme for their Challenge quilt this year is 'Recycle or Repurpose'. I was a little stuck for ideas but then I thought of all the fabrics I have to recycle. I have so many T shirt off-cuts that I usually send to Salvation Army for textile recycling, those I could use. Then a customer sent me extras ties for my own use so I could use those and recently I have started saving selvedges off fabric. So my plan was set. 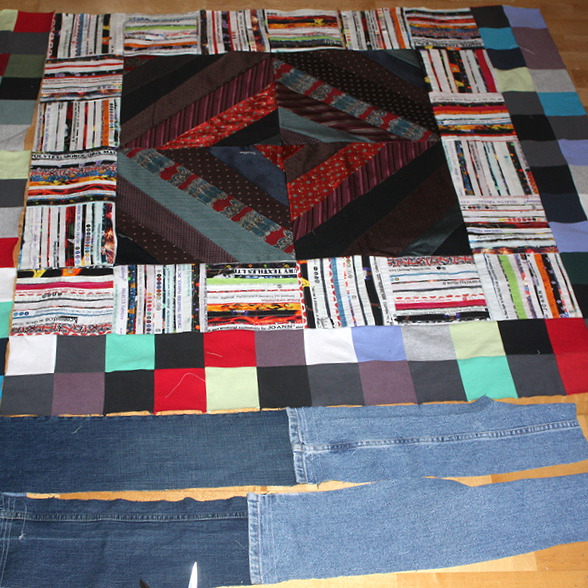 So I went with the ties in the center, surrounded by a row of selvedge squares and then two rows of T shirt squares and finally my border is denim form jean legs.